In the world of full-size trucks, the Big Three each have a recognizable player: Ford has the F-Series, Chevy has the Silverado, and Dodge has the Ram. This modified Dodge Ram sports the 1994-’01 body style, which debuted the macho, big-grilled style seen on every generation of Ram since. This particular Ram sports some typical American truck modifications. The big tires and raised suspension help it get traction on rough terrain and climb over obstacles when the road ceases to exist. The giant exhaust stacks mean the truck is probably a diesel; they evoke the black-smoke belching pipes of an eighteen-wheeler. Overall, the blue Ram is as close to typical as custom 4x4s get. The most unusual part of it is its location. 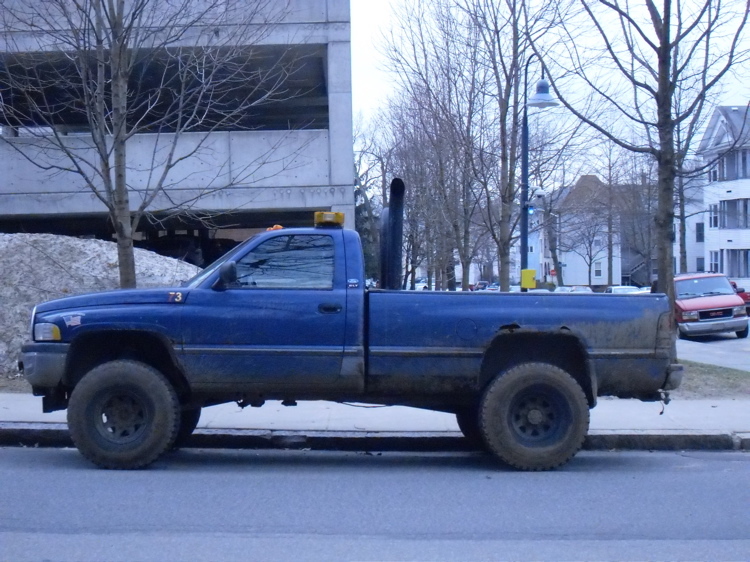 I found the mud-splattered truck parked on a city street in Worcester, Massachusetts. The potholes may be bad, but they don’t require that much suspension articulation.